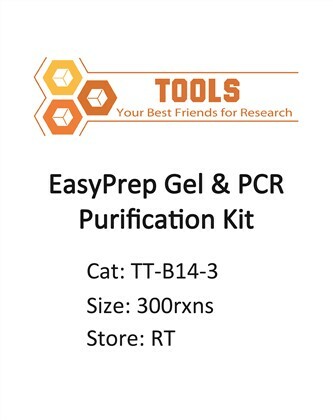 EasyPrep Gel & PCR Purification Kit provides a fast, simple, and high-effective DNA purification from agarose gel and from PCR reactions. The unique Spin Column is able to retrieve DNA fragments from TAE or TBE. It is suitable for PCR clean-up and gel filtration. The recovery efficiency is more than 80%. The DNA purified by this kit is high quality and serves as an excellent template for restriction enzyme digestion, PCR analysis, sequencing, Genomic DNA library, DNA ligation and transformation procedures. 1. High recovery of ready-to-use DNA. 2. Clean up of DNA from agarose gels and PCR reactions.